It’s National Sun Safety Week! We would like to remind you to block the sun, not the fun. According to the Sun Safety Alliance, sun exposure leads to many health concerns, including aging and potentially cancer, yet only about 20% of Americans use sunscreen daily. 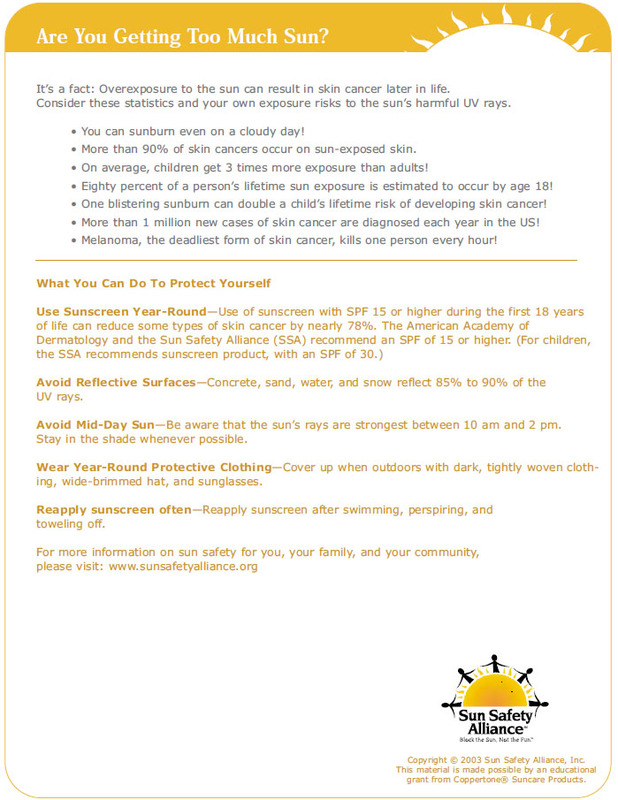 This week, remember the importance of protecting yourself from the harmful rays of the sun. Find out if you are getting too much sun from the photo below. 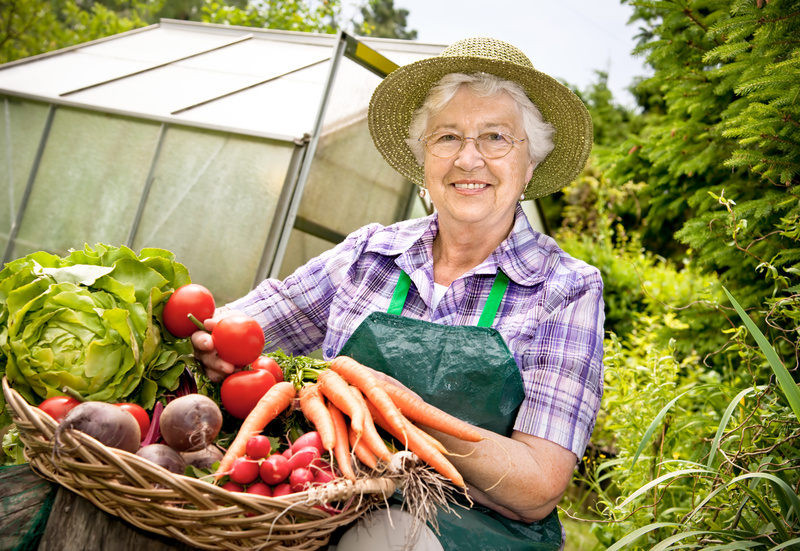 In honor of National Nutrition Month we would like to educate you on healthy eating for older adults. Eating a variety of foods from all food groups can help you get the nutrients your body needs as you age. A healthy eating plan emphasizes fruit, vegetables, whole grains and low-fat or fat-free dairy; includes lean meat, poultry, fish, beans, eggs and nuts; and is low in saturated fats, trans fats, cholesterol, salt (sodium) and added sugars. Eat fruits and vegetables. They can be fresh, frozen or canned. Eat more dark green vegetables like leafy greens or broccoli and orange vegetables like carrots and sweet potatoes. Eat at least three ounces of whole-grain cereals, breads, crackers, rice or pasta every day. Have three servings of low-fat or fat-free dairy (milk, yogurt or cheese) that are fortified with vitamin D to help keep your bones healthy. Make the fats you eat healthy ones (polyunsaturated and monounsaturated fats). Switch from solid fats to oils when preparing food. If you are currently inactive, start with a few minutes of activity, such as walking, and gradually increase this time as you become stronger. 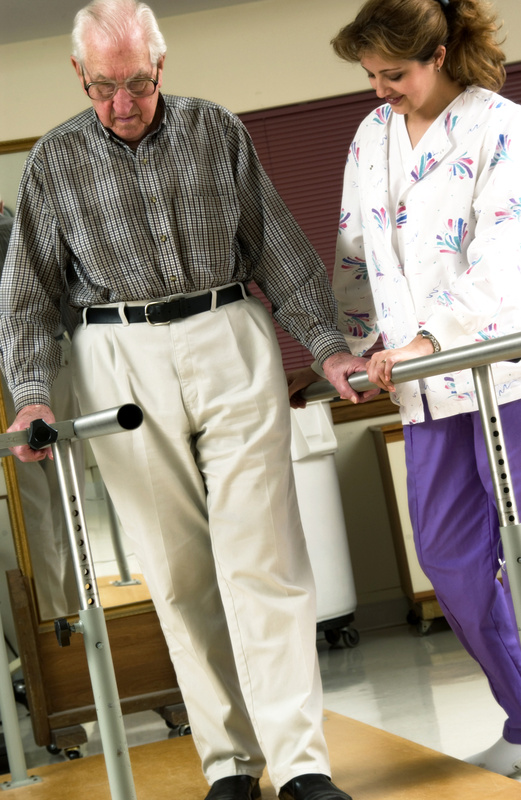 Check with your healthcare provider before beginning a new physical activity program. For more information on eating right or National Nutrition Month go to www.eatright.org. This week is National Healthcare Human Resources Week. 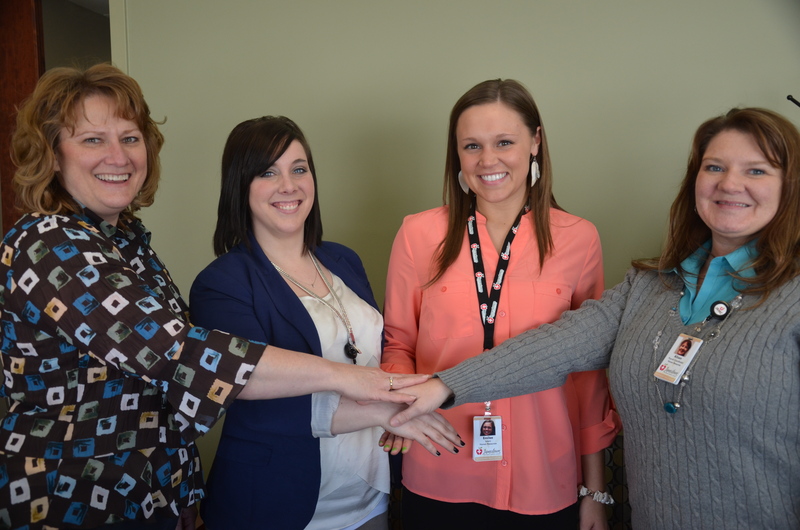 JRMC would like to recognize the great work that our Human Resources department does here for all employees. We recognize them for the daily issues they face in workforce, compensation and benefits, employee relations, and health reform. Thank you to the JRMC Human Resources department. We have many great job opportunities available at JRMC: go to www.jrmcnd.com to see if there is an opportunity to join our growing team! Jamestown Regional Medical Center is observing Patient Safety Awareness week this week, March 3rd – 9th, 2013. Medication safety and health care culture and safety are the focus of Patient Safety Awareness Week. This year’s theme, Patient Safety 7/365, reminds health care professionals and health consumers that providing safe patient care requires constant dedication and effort, 365 days a year. 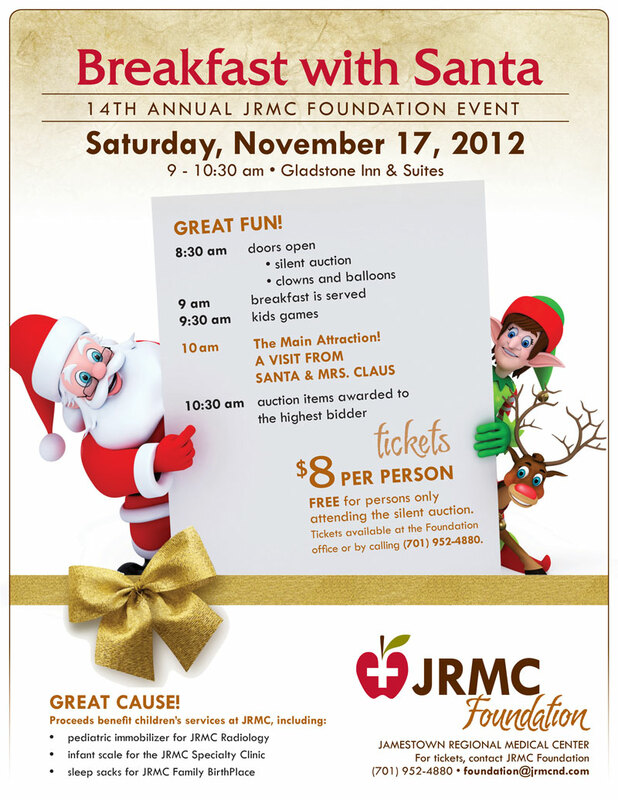 At JRMC we are dedicated to working together with our patients to provide the safest care possible. Patient Safety Awareness Week is an annual education and awareness campaign for health care safety led by the National Patient Safety Foundation, NPSF. It is important to focus on patient safety all year round and recognize the work being done to improve health safety worldwide. This requires a constant effort, 365 days a year. JRMC is proud of the work that each of our staff does to make JRMC a leading health care provider in our community. It was New Year’s babies times two at Jamestown Regional Medical Center on Tuesday. Amy Stegmiller delivered an 8-pound, 9-ounce baby boy about 1 p.m. It was the second child for Amy and her husband, Wes, of Jamestown. The couple named their son Joshua. At about 10 p.m. Ruth Schott delivered a 7-pound, 11-ounce baby boy. It was the first child for Ruth and her husband, Andy, of Jamestown, and he was named Leon. Joshua will join 5-year-old Maggie in the Stegmiller family. Maggie has been telling everyone how cute her new brother is, according to Marge Kavlie, who describes herself as an “adopted grandmother” who helps out the family. Maggie would not comment personally for this article. Ruth Schott also had no plans for bringing in 2013 by giving birth. Andy Schott had more pragmatic thoughts on the birthdate. Both fathers had a tough time looking ahead to 2031 when their sons should graduate high school. Little Leon Schott will go home wrapped in a John Deere blanket made by one of the child’s grandmothers, Andy Schott said.